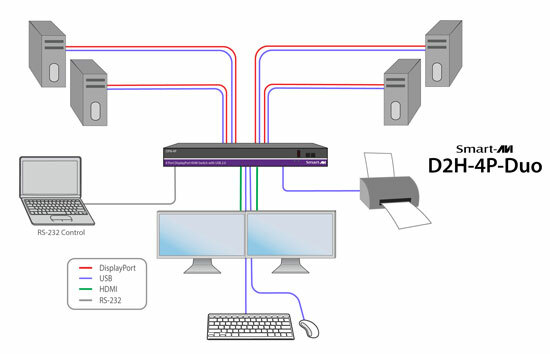 D2H-4P-Duo is a dedicated multi-platform KVM switch capable of managing four 4K computers through a single, central workstation. Built with two ultra-HD ready HDMI outputs, the D2H-4P-Duo is the first Displayport switch on the market to offer full video emulation directly from the device. Up until now, DisplayPort switches lost emulated picture when disconnected from monitors, leading to confusion and disorganization upon reconnecting. With D2H-4P-Duo, full EDID-assisted HDMI video emulation ensures visual workspaces and screen resolutions are remembered every time: simple! The D2H-4P-Duo is DisplayPort 1.2 and HDMI compliant, supporting screen resolutions up to 4K Ultra-HD (3840x2160 @ 30Hz) for remarkable and responsive video emulation. Additionally, the D2H-4P-Duo is USB peripheral-friendly, compatible with printers, keyboards, and mice. The D2H-4P-Duo is also easy to control with both a simple front-panel interface, as well as RS-232 functionality. The D2H-4P-Duo offers simplified management between four DisplayPort equipped computers' USB 2.0 outputs. Keyboards, mice, and other connected USB devices can be swtiched between with ease. This dynamic KVM console can be controlled via hot keys or RS-232 commands, as well as directly through the console's easy-to-read front panel. The D2H-4P-Duo features EDID Pass-Through technology and source recognition, which enables smooth and efficient switching in virtually any scenario. This plug-and-play EDID functionality makes set up hassle free and simple. The USB keyboard and mouse emulation utilized by D2H-4P-Duo provides quick source switching via keyboard hot keys. D2H-4P-Duo simulates the presence of a keyboard and mouse for every attached computer through a USB cable. This essential function simulates keyboard, video, and mouse control for all connected computers, so switching between each is kept seamless and completely uniterrupted. The D2H-4P-Duo has a broad range of applications, but the main function is to centralize the access of up to four computers that support DisplayPort displays in a single workstation. Not only does it function as a KVM console, but it also supports USB 2.0 functionality. This allows users to access nearby USB device, including those not supported by other KVM switches. The D2H-4P-Duo is the ideal solution for medical, industrial, studio and defense applications, where it is not practical or safe to have multiple CPUs in the vicinity of the workstation. RS-232: Any external device or program supporting RS-232 can control the D2H-4P-Duo. The D2H-4P-Duo uses a very simple protocol that enables easy integration with other devices. INDEPENDENT SIMULTANEOUS DEVICE SELECTION: Flexibility is key with the D2H-4P-Duo. It enables the use of a USB keyboard and mouse of one computer while other USB peripherals such as scanners and printers are connected to other computer sources. D2H-4P-Duo maintains the ability to switch all connected devices to any one of the computer sources as with any other KVM switches. Question: Does this support having one DisplayPort input drive both HDMI outputs, or does the input have to use both ports? The SmartAVI D2H-4P-Duo would need both DisplayPort inputs plugged in for dual monitor support - It does not support DisplayPort Multi-Stream-Transport (MST). Currently (10/18/2016), the only DP KVM that I am aware of that supports MST is the 2-Port Aten CS782DP. If you have any questions about MST, or would like a recommendation based on your application, please feel free to contact your KVM Switches Online sales representative directly. Question: What is in the package? Are all the cables included? Question: I thought HDMI was limited to 2560 x 1600 resolutions. Does this KVM actually provide 3840 x 2160? HDMI version 1.4, which features a bandwidth of up to 10.2Gbps, introduced the ability to deliver 4K video of 3840x2160 @30Hz. This SmartAVI D2H-4P-Duo is indeed able to provide 3840 x 2160 (30fps). HDMI version 2.0, which features a bandwidth of up to 18Gbps, introduced the ability to deliver full 4K video of 3840x2160 @60Hz. You may also be interested in the SmartAVI UHDN-4P-DUO HDMI to HDMI KVM switch which can provide 3840 x 2160 (60fps). Question: How does it support audio? 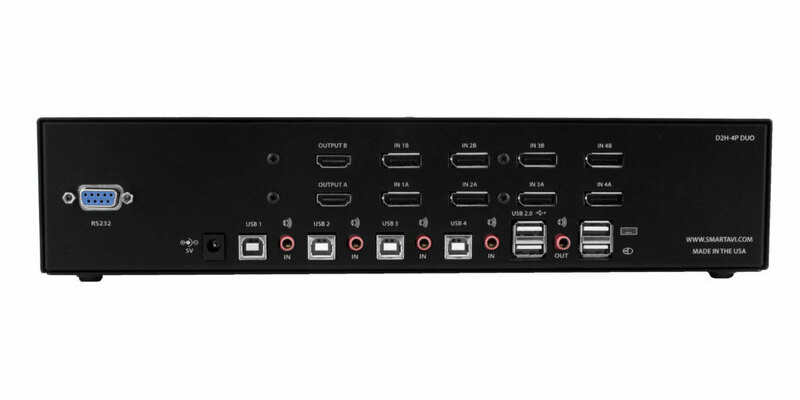 The SmartAVI D2H-4P-Duo supports stereo audio sharing over a separate 3.5mm audio connector; Each of the 4 source inputs has a 3.5mm stereo audio port that you can plug in an audio source to, and the user console section also has a 3.5mm stereo audio port for output. Question: The picture does not match the picture in the referenced manual. The manual shows audio ports on the back but the picture here does not show any audio ports. Answer: The new versions of the D2H series including this D2H-4P-Duo do indeed have audio ports on the back. We have updated the images on this page to reflect that feature. Thank you for your feedback! Please let us know if there is anything else we can help you with!